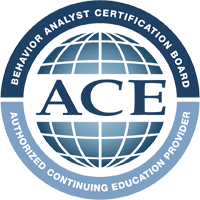 The primary purpose of this website is to provide information pertinent to the practice of behavior analysis for the purpose of personal education and/or fulfilling BACB® continuing education requirements. PRIVACY Behavior University collects user e-mail address for the purpose of payment. E-mail addresses are also used for e-mail communications and promotions, to which users may unsubscribe. Behavior University does not share any user information with other businesses. Behavior University may use user information if ever audited by the BACB® for user verification. User behavior may be collected by Google Analytics. These data are reviewed for search engine optimization consultation by agents of Behavior University and are used to better understand user behavior to inform marketing and to make the site more user-friendly. Copyright. Unless otherwise indicated, all Website materials, including, without limitation, text, pictures, graphics and other files and the selection and arrangement thereof are proprietary and copyrighted materials of Behavior University or by the original creator of the material. You may electronically copy and print the materials on this Website for personal, noncommercial use only, provided you do not modify the materials and that you retain all copyright and other proprietary notices contained in the materials. Any other use of the materials in this Website—including any commercial use, reproduction for purposes other than described above, modification, distribution, republication, display or performance—without the prior written permission of Behavior University is strictly prohibited. Any unauthorized use of any material contained on this Website may violate copyright laws, trademark laws, the laws of privacy and publicity and communications regulations and statutes. Trademarks. The trademarks, service marks, trade names, and logos (the “Trademarks”) used and displayed on this Website are registered and unregistered Trademarks of Behavior University. In addition, all page headers, custom graphics, button icons, and scripts are service marks, trademarks and/or trade dress of Behavior University, and may not be copied, imitated or used, in whole or in part, without the prior written permission of Behavior University. You acknowledge that the Trademarks used and displayed on this Website are and shall remain the sole property of Behavior University or the Trademark owner. Nothing in this Agreement shall confer any right of ownership of any of the Trademarks in you. The misuse of the trademarks displayed on this Website, or any other content on the Website, is strictly prohibited. Hyperlinks. You are granted a limited, nonexclusive right to create a “hypertext” link to this Website provided that such link is to the entry page of this Website and does not portray Behavior University or any of its products or services in a false, misleading, derogatory, or otherwise defamatory manner. This limited right may be revoked at any time for any reason whatsoever. You may not use framing techniques to enclose any Behavior University trademark, logo or trade name or other proprietary information including the images found at the Website, the content of any text or the layout/design of any page or any form contained on a page without Behavior University’s express written consent. Behavior University may provide links to Web pages and content of third parties (“Third Party Content”) as a service to those interested in this information. Behavior University does not monitor, nor does it have any control over, any Third Party Content. Behavior University does not endorse or adopt any Third Party Content and can make no guarantee as to its accuracy or completeness. Behavior University makes no representations or warranties of any kind regarding such Third Party Content, or any information contained therein, and undertakes no responsibility to update or review any Third Party Content. When leaving Behavior University Website, you should be aware that Behavior University terms and policies no longer govern, and, therefore, you should review the applicable terms and policies, including privacy and data gathering practices, of that website. Users use these links and Third Party Content contained therein at their own risk. Downloadable Materials. Any software, including codes or other materials that are made available to download from this Website, is the copyrighted work of Behavior University and/or its suppliers and affiliates, or the original creator of the material. Limited Access. Except as otherwise expressly permitted by Behavior University, any access or attempt to access other areas of the Behavior University computer system or other information contained on the system for any purposes is strictly prohibited. You agree that you will not use any robot, spider, other automatic device, or manual process to “screen scrape,” monitor, “mine,” or copy the Web pages on the Website or the content contained therein without Behavior University’s prior, express, and written permission. You will not spam or send unsolicited e-mail to any other user of the Website for any reason. You agree that you will not use any device, software or routine to interfere or attempt to interfere with the proper working of the Website. You agree that you will not take any action that imposes an unreasonable or disproportionately large load on Behavior University infrastructure. SUBMISSIONS You agree that any materials, including but not limited to questions, comments, suggestions, ideas, plans, notes, drawings, original or creative materials or other information, provided by you in the form of e-mail or submissions to Behavior University, or postings on this Website, are non-confidential unless otherwise agreed in writing by Behavior University and that Behavior University shall have a perpetual, worldwide, non-exclusive license to use such materials in connection with the maintenance of its Website. DISCLAIMER WARRANTY This Website, including all software, functions, materials, and information, is provided “as is” without warranties of any kind, either express or implied. Behavior University disclaims all warranties, express or implied. Behavior University does not warrant or make any representations regarding the operation of this Website, the use, validity, accuracy or reliability of, or the results of the use of the materials on this Website or any other websites linked to this Website. The materials of this Website may be out of date, and Behavior University makes no commitment to update the materials at this Website. Behavior University does not and cannot guarantee or warrant that the files available for downloading from this Website, if any, will be free from infection, viruses, worms, Trojan horses, or other code that manifest contaminating or destructive properties. Behavior University does not warrant that this Website, software, materials, products, or services will be uninterrupted or error-free or that any defects in this Website, software, materials, products, or services will be corrected. LIMITATION OF LIABILITY In no event will Behavior University, its suppliers, affiliates or other third parties mentioned at or in this Website be liable for any damages, including, without limitation direct, indirect, special, incidental, or consequential damages, resulting from lost profits, lost data or business interruption arising out of relating to the use, inability to use, or resulting from the use of this Website, any websites linked to this Website, the materials, software or other information contained in any or all such websites, whether based on warranty, contracts, statutes, regulations, tort (including but not limited to, negligence) or any other legal theory and whether or not advised of the possibility of such damages. If your use of the materials or information from this Website results in the need for servicing, repair or correction of equipment or data, you assume all costs thereof. Some states do not allow the exclusion or limitation of incidental or consequential damages, so the above limitation or exclusion may not apply to you. INDEMNITY You agree to defend, indemnify and hold harmless Behavior University, its affiliates, independent contractors, service providers, consultants and licensors, and their respective directors, employees and agents, from and against any third party claim, damages, costs and expenses (including, but not limited to, reasonable attorneys’ fees) arising out of your use of the Website or the use of any content, photographs, images or other materials you provide, including without limitation any actual or threatened suit, demand, or claim made against Behavior University and/or its affiliates, independent contractors, service providers, or original creators of posted materials, that use of the content, photographs, images or other material provided infringes, misappropriates or otherwise violates any copyright, trademark, right of publicity or other proprietary right of any third party. You agree to pay any judgment or reasonable settlement offer resulting from any such suit, demand or claim. USE BY CHILDREN By using this Website you are representing to us that you are 18 years old or older. Behavior University will not be liable for any damages that may result from misrepresentation of age by a user of our Website. U.S. GOVERNMENT RESTRICTED RIGHTS The materials on this Website are provided with “RESTRICTED RIGHTS.” Use, duplication, or disclosure by the government is subject to restrictions as set forth in applicable laws and regulations. Use of the materials by the government constitutes acknowledgment of Behavior University’s or other owner’s proprietary rights in them. REVISIONS TO THIS AGREEMENT Behavior University may revise this Agreement at any time without notice by updating this posting. By using this Website you agree to be bound by any such revisions and should therefore periodically visit this Website and page to determine the then current terms and conditions of use to which you are bound. TRANSMISSIONS Any material, information or idea you transmit to or post on this Website by any means will be treated as non-confidential and non-proprietary and may be disseminated or used by Behavior University or its affiliates for any purpose whatsoever, including, but not limited to, developing, manufacturing and marketing products. You are prohibited from posting or transmitting to or from this Website any unlawful, threatening, libelous, defamatory, obscene, scandalous, inflammatory, pornographic, profane material or any other material, including but not limited to any material that could give rise to any civil or criminal liability under both domestic and international law. REFUNDS Users may request a refund prior to use of a course. Requests are considered but not automatically granted. Behavior University can deny refund to anyone who has already started the course. All refunds are granted using the authorize.net refund system. Per authorize.net refund policy, no refund may granted if 60 days or more have passed since the transaction. Please contact support@behavioruniversity.com for refund requests. Severability; Nonwaiver; Assignment If any provision(s) of this Agreement is held by a court of competent jurisdiction to be contrary to law, then such provision(s) shall be construed, as nearly as possible, to reflect the intentions of the parties with the other provisions remaining in full force and effect. Behavior University failure to exercise or enforce any right or provision of this Agreement shall not constitute a waiver of such right or provision unless acknowledged and agreed to by Behavior University in writing. The section titles in this Agreement are solely used for the convenience of the parties and have no legal or contractual significance. This Agreement may be assigned in whole or in part by Behavior University. This Agreement may not be assigned in any manner by you without the express, prior written permission of Behavior University.